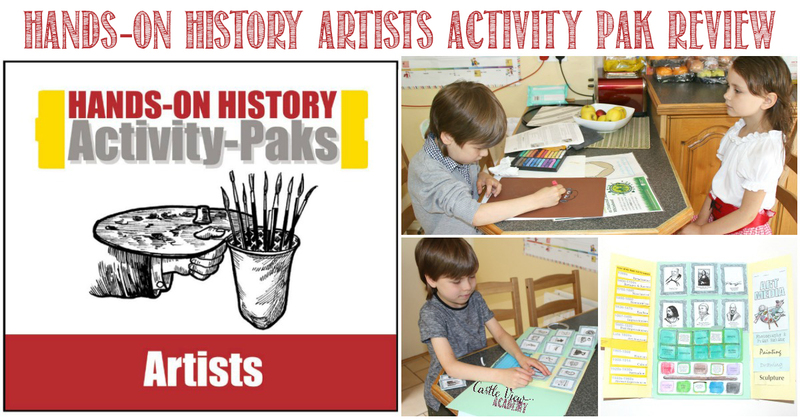 Home School in the Woods is our favourite hands-on history company and the children were very happy to be learning more about Artists from their Hands-on History Activity-Paks and sharing their review with you. 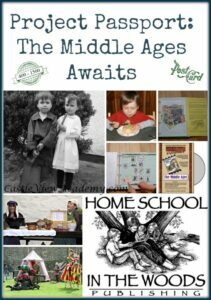 My children really enjoy the Home School in the Woods products; they’re our go-to company for hands-on history projects. Tristan and Kallista unanimously agreed that they wanted to learn more about artists and were keen to get started when it arrived. It turns out it wasn’t quite what they expected; I think they thought it was going to be more of an art class rather than also being art history, but they are indeed learning some interesting facts that they like to share with us as they go. 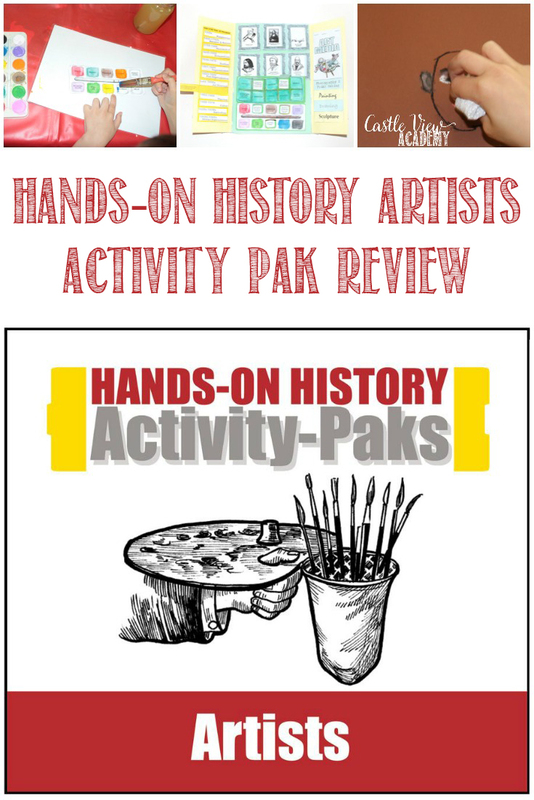 We received a digital download of the Activity Pak (the Activity Paks are larger than lapbooks, but not as intense as a full unit study), and this included all of the files and information that we needed. If you haven’t used a product from HSITW before, you may find it a bit confusing to work your way through all of the files. Open up the main html start page and print off all of the initial instructions first. Then go through them one at a time to print the rest of the files; you’ll need white and coloured paper as well as white and coloured card stock. It will take a little time to work your way through the printing and get everything organised; page protectors are great for this! You can choose to work on one project at a time, or work on them simultaneously. 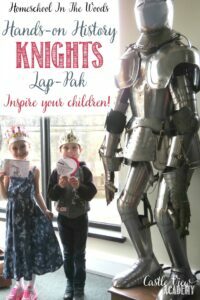 We chose to spend some time doing all of the printing and cutting at the start to get it out of the way and then the kids could work on the projects in a more relaxed way. Tristan started by painting and putting together the Paint Box Vocabulary, which was very colourful and a fun way to learn it. While he did this, Kallista worked on cutting out the Art Movements, which they are filling in as they learn about them in the other activities. Then the kids worked together to sort the mediums into the applicable types of artwork (an answer key is provided for double-checking). They started with the ones they knew, then looked up the words they weren’t familiar with to learn more about them. Kallista, especially has been enjoying working with the sketch book, while Tristan is more about doing the larger art projects that are also included. Here, he is doing a Peter Paul Rubens imitation using only red, white, and black pastels on brown paper, as instructed; however, this was meant to be a self-portrait, but since he had already done a selfie for the front of his sketch book, he chose to draw his sister! 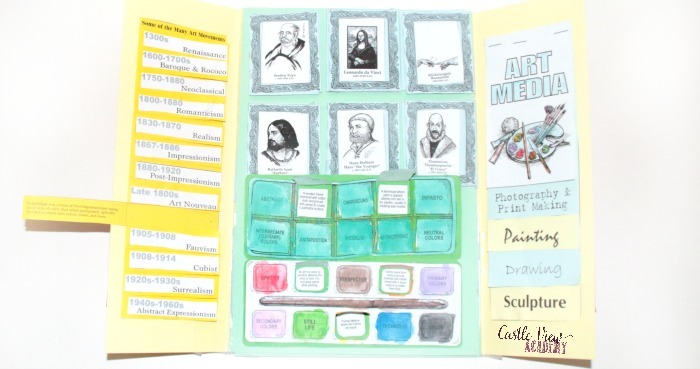 There are 33 artists to work on; most of the booklets include a picture of an artist, their birth and death year, and a picture of an art piece they are known for. Children then find out where they were born, their style, art techniques they use, and some of the works they are famous for. For many children, this wouldn’t take very long, but my children get caught up in following links to discover more about their lives and art; more than what is asked directly to be filled in. Although I groan at the time they spend on some projects, I can’t complain that they want to know more and are willing to do the research themselves. There is also an Art Gallery file folder game included; we haven’t yet played it because the kids are still working on colouring in the pictures. I love the selection of pictures that children will learn about with this game. In fact, the game cards could even be hung up on a wall for children to look at and admire between games. 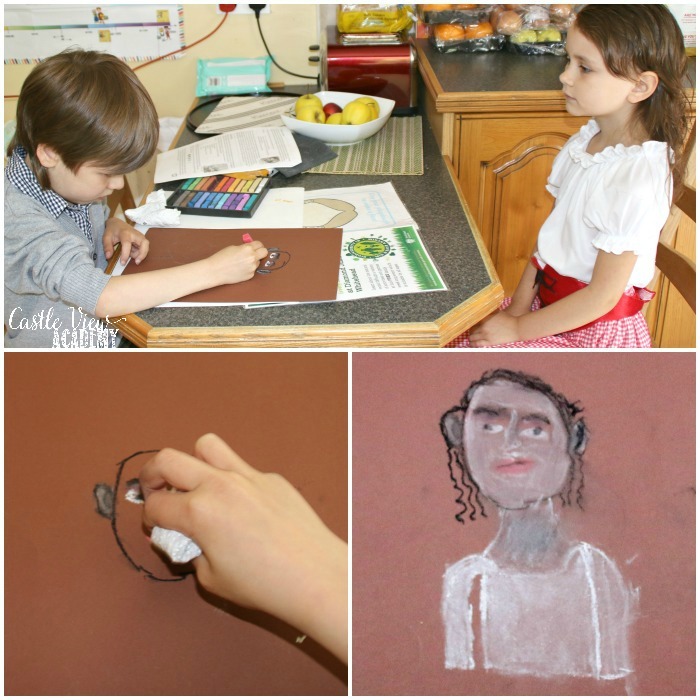 The children’s favourite part of this Activity Pak are the sketching and Paint Like The Masters art lessons. They love creating art and getting their hands full of colour. I love to see them enjoying themselves in this way, too. I also liked that they were doing some research and learning about specific artists and movements. As with all of the Home School in the Woods products that we’ve used over the past few years, the children are learning about a subject they enjoy in a fun and engaging way. There is a lot of work that goes into creating HSITW products, and a lot of work to put them together at home, but this is what makes them so memorable and worthwhile. 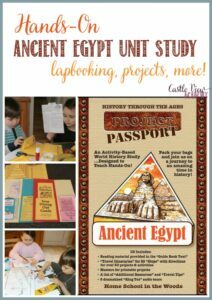 Home School in the Woods has just released their latest product, their Project Passport: Ancient Rome! Time Traveler American: New World Explorers, Colonial Life, The American Revolution, The Early 19th Century, The Civil War, Industrial Revolution through Great Depression, and World War II. Project Passport World History Studies: Ancient Greece, Ancient Egypt,The Middle Ages, Renaissance & Reformation, and Ancient Rome. 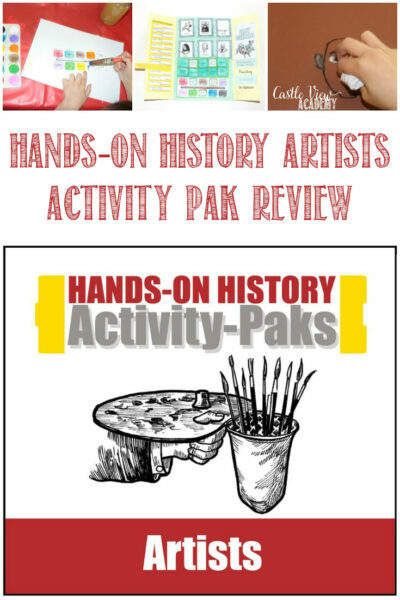 Activity-Paks: Composers, Artists, The Old Testament, and The New Testament. Lap-Paks: U.S. Elections, 20th Century in America, Wonders of the World, Benjamin Franklin, Knights. 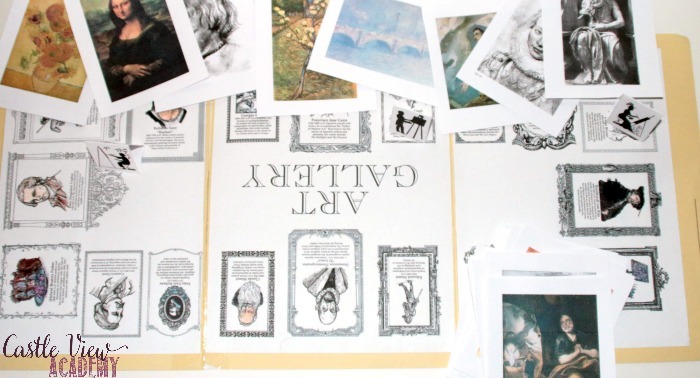 A-La-Carte projects, for when you only want a specific activity rather than a whole package. To read more reviews about Home School in the Woods by the Homeschool Review Crew, click on the graphic below and follow the instructions. You will find 90 honest reviews by the Crew. 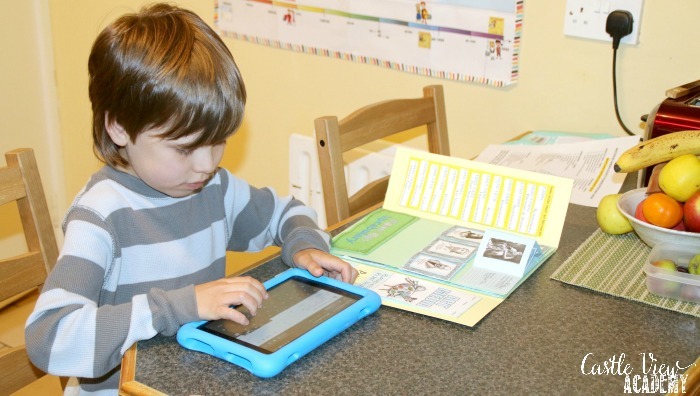 If you’d like to know more or would like to follow Home School In The Woods, you can connect with them through their website, Facebook, Twitter, Pinterest, YouTube, and Google+.